+$10 membership if not current. 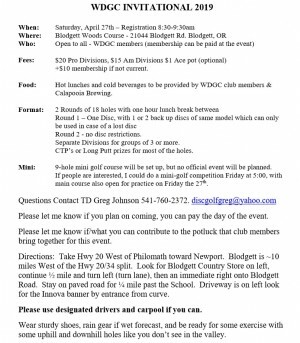 Food:	Hot lunches and cold beverages to be provided by WDGC club members & Calapooia Brewing. Round 2 - no disc restrictions. Separate Divisions for groups of 3 or more. CTP’s or Long Putt prizes for most of the holes. Mini:	9-hole mini golf course will be set up, but no official event will be planned. If people are interested, I could do a mini-golf competition Friday at 5:00, with main course also open for practice on Friday the 27th. Please let me know if you plan on coming, you can pay the day of the event. 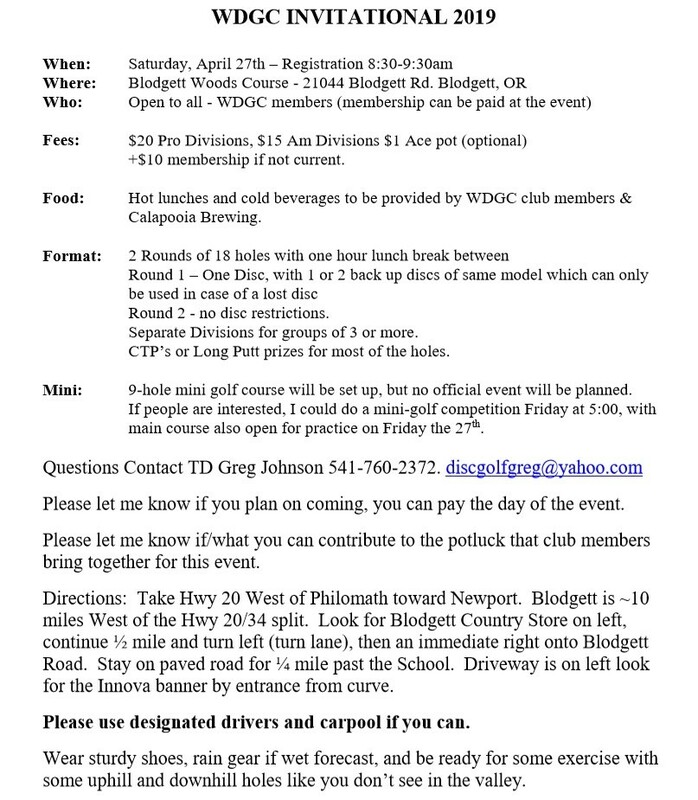 Please let me know if/what you can contribute to the potluck that club members bring together for this event. Directions: Take Hwy 20 West of Philomath toward Newport. Blodgett is ~10 miles West of the Hwy 20/34 split. Look for Blodgett Country Store on left, continue ½ mile and turn left (turn lane), then an immediate right onto Blodgett Road. Stay on paved road for ¼ mile past the School. Driveway is on left look for the Innova banner by entrance from curve. Please use designated drivers and carpool if you can. Wear sturdy shoes, rain gear if wet forecast, and be ready for some exercise with some uphill and downhill holes like you don’t see in the valley. - 9:30am All Registration is day of the event.